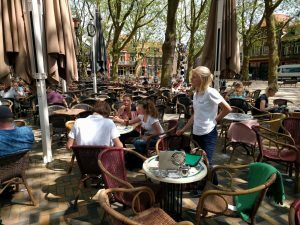 Imagine you would be standing in front of the train station in Delft and you need to go to a larger supermarket, do you know the one that is most close to you, preferably in meters and minutes? Most likely you are mistaken, or your perceived distance or travel time is different from the real ones. Did you know that the direct distance to the Aldi at the Westlandseweg is shorter than to the Jumbo at Bastiaansplein? Many travel behaviour models (incorrectly) assume that people do have perfect information about the urban environment. 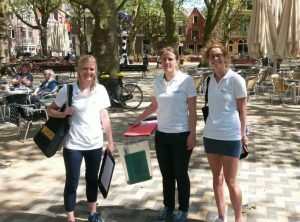 After several weeks of piloting, this Thursday a team of ALLEGRO and department of Transport and Planning collected surveys at the Beestenmarkt (Delft). 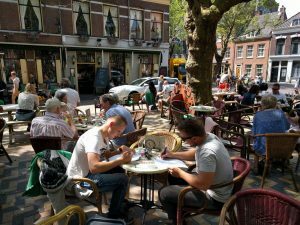 Citizens, visitors and tourists were asked to state their perceived distance and direction between several locations within Delft. After processing and analysing the data, the results will help us to quantify urban cognition by assessing people’s perception of space, which is different from the real environment. As part of the ERC project lead by Serge Hoogendoorn on ‘unrAveLLing active modE travellinG and tRaffic’, we hope to integrate our findings into travel models to make them a bit more (ir)rational.